...or is it a crisp? When I initially breezed over this recipe, I assumed "crisp", so I got out the oats. When I actually read it, there were no oats to be found! Shoot. I love putting oats in everything. Mix together in a bowl and pour into a large, greased ramekin. (It's not quite enough for an 8x8 pan. A ceramic loaf pan would work nicely I bet). Distribute the crumb mixture evenly over the fruit already in the ramekin. (Can you tell I have a favorite dish? I think it's for dips...but I use it for dips and everything else. Amazing! Strawberries and rhubarb are a perfect pair. We made a dump cake with these two together + pineapple; that was yummy too. Share away, Krista! It was really good. 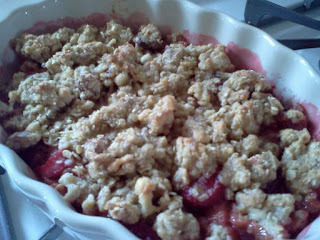 I made it for my husband who loves rhubarb, whereas I'm not crazy about it. And I still liked it!